Stop! In the Name of…Writing? In an effort to improve the writing skills of my students and better prepare them for the Kansas Writing Assessment, the Multidisciplinary Performance Task, I have begun implementing the Stoplight Writing strategy. I attempted to use this strategy in my classroom last year, but as a last ditch effort before the test rather than a regular activity the students experienced throughout the entire school year. This year however, my students are writing every unit using stoplight writing, and the dramatic difference in the finished products from last year to this year are extraordinary. Last year I feared that my 7th grade students didn’t know how to write a complete sentence, this year I am finding that my expectations for the students are too low and every unit I raise the standards for their finished work. 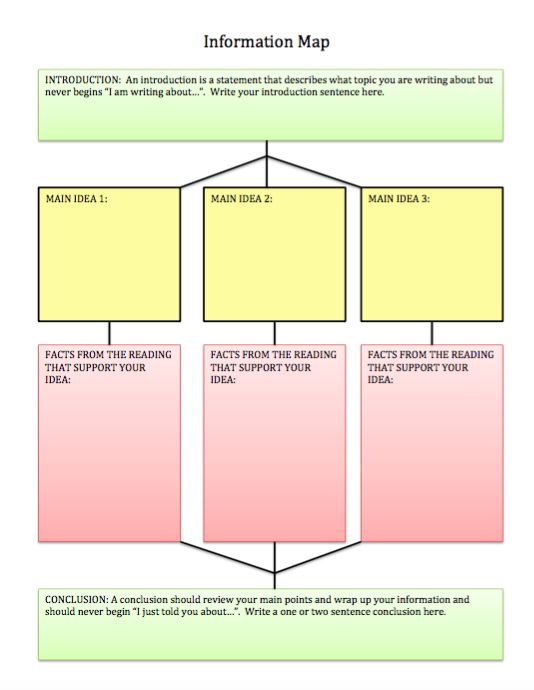 The strategy is simple enough; students are given a document or source of information which they take notes on, they then color coordinate their notes (green, yellow, and red hence the name stoplight), transfer their color coordinated information on to a graphic organizer, and then turn that graphic organizer into complete sentences in the form of a paragraph or essay. So far, to get students accustomed to the process rather than the sources of information, I have used the textbook as the information that students are taking notes on (ideally primary sources would be the source of information to prepare students for the MDPT). I teach World Geography so I try to focus our writing assignments on the modern history of the regions we are studying, we have exclusively been practicing persuasive writing and I have found that this subject matter better fits that style of writing. This year, my school is focusing on similar strategies across every classroom and grade level, so my students always use Cornell or 2-Column Notes. 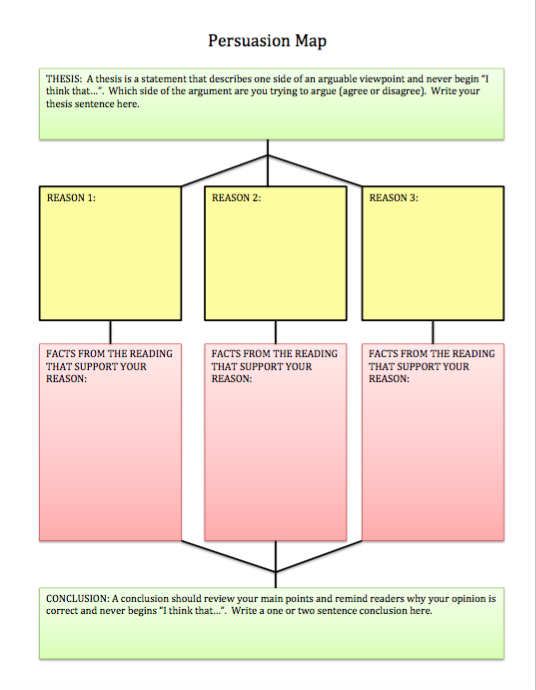 I have also created a Persuasion Map (Information Map for informative writing) that students use as their graphic organizer which I require them to then turn into eight complete sentences (one for every box on the map). What I am finding most helpful about this multi-step process is that my somewhat lazy students get very tired of copying information word for word three times and are more likely to end up with a paragraph that is in their own words rather than a regurgitation of information straight out of the textbook. The color choices are something that I borrowed from a conference presentation I attended last year (thank you Wamego Middle School! ), and to which I then added the following descriptors. Green means go: The thesis sentence is colored green because it is the signal for the reader to go and begin reading the information. The conclusion sentence is also colored green because it echoes the thesis and is also a signal for the reader to go beyond the page and think about the information that was presented. Yellow means slow down (or speed up if you drive anything like me! ): The reasons or main ideas are colored in yellow because they are a signal for the reader to slow down and focus on important information that is coming up ahead. 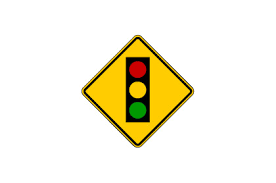 Red means stop: The explanations or supporting facts are colored in red because they are a signal for the reader to stop and focus on the details proving the thesis. The great thing about using this strategy every unit is the students now know what to expect and it has become almost automatic for them. They are slowly but surely becoming experts at picking out key information, finding main ideas and supporting details, writing thesis sentences, and making a claim with facts to back up their arguments. Their English teachers will be so proud of them! As a future teacher I found this extremely enlightening and will definitely be using most of these in my own future classroom. I’m so glad you found this article useful, good luck in your future as an educator!